"Blue sky and the deeper blue sea dominated the landscape of the beach. Tropical pines called Aru had witnessed these surroundings for the past hundred years or more. The species was native to Australia, and now it was found there. There were thousands of them. Their scientific genus was Casuarinas. When the sea breeze blew into the plants' needle-like leaves, the sound of the wind made a beautiful rhythm. These trees kept growing taller and taller. There were no better feeling than resting under the casuarinas while enjoying the cool air coming from the sea. That was why people called the place Tanjung Aru, or, in Malay, Bay of the Casuarinas." It used to be one of the most beautiful and cleanest place on earth; but now although still inspiring and nice, is very dirty. This is Tanjung Aru, located at the end of Jalan (Street) Tengku Abdul Rahman, 6 kilometer from the heart of the Jesselton (Kota Kinabalu) city center. The sand is no longer fluffy and white but brown and muddy. This is due to the sewerage system that drained their wastes into the sea. But yet what makes this place famous is the Casuarina trees; thousands of them dotting the landscape. Casuarina is also known as she-oak or ironwood. Now it is also home to an introduced species of bird; the green parrots. There are also local birds. I myself had seen and touched a juvenile Sunda Scops Owl that had accidentally fallen from a tree. We put it back on that same tree but unsure whether the mother can bring it back to its nest. There is nothing much we could do. I saw dozens of hornbills which many of us had never seen except in printed or digital medias. 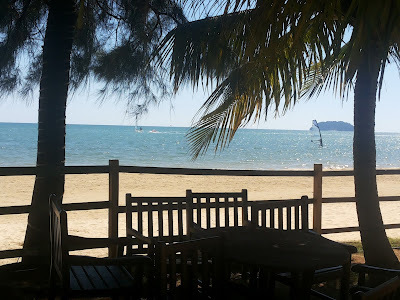 Tanjung Aru is a famous place for both locals and foreign tourists. There is a park called Prince Philip Park, which now looks neglected; but nevertheless still frequently visited. In the 1970's right until the mid of the 1980's the Tanjung Aru Skating Ring was a popular place to hang around for kids as well as teenagers. Nowadays it is totally abandoned and full of overgrown weed. However, the only reason why people came here was its nostalgic reputation and also because of hawker stalls selling fresh young coconuts and tidbits. At the tip of Tanjung Aru lies the Shangri-la Beach Resort also known as Tanjung Aru Beach Hotel. One of the oldest golf club in Borneo, the nine holes Kinabalu Golf Club (KGC) is also located here.